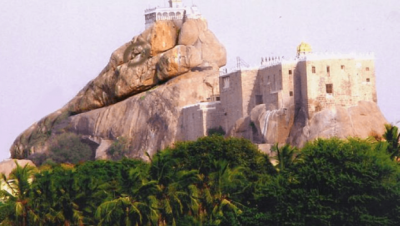 The most famous land mark of Tiruchirappalli is Rockfort Temple. It is also called as Ucchi Pillaiyar Kovil. It is in the heart of the city. This is a275 ft. tall rock structure. It is reached by a step flight of 437 steps cut into the rock. 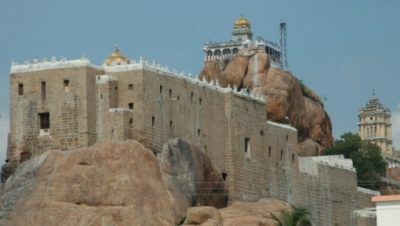 Halfway up is the Sri Thayumanaswamy Temple, dedicated to Lord Shiva. It has a 100 pillared hall, and a Vimana. There are inscription in these temple that date back to 3rd century B.C. 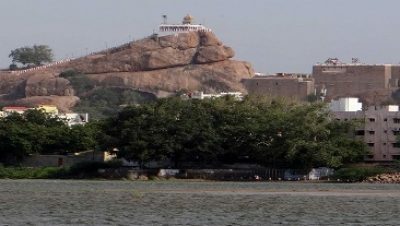 From its summit tourists can get a fantastic view of the town plus its other main landmark, Srirangam, Cauvery River, Coleroon River, Thiruvanaikal Kovil, etc. The temple is located 5 kms from Central Bus Stand and 1 km from Chathiram Bus Stand. Trichy. Government and private bus services are available to reach Rockfort.